There are a lot of ways to watch a movie in Dubai. From IMAX and 4DX experiences to fine dining meals served in premium seats, local cinemas have gone above and beyond to get people off their couches and into theaters. But the underlying cinema technology certainly has room for improvement and something Dolby thinks it can solve with its own set of flagship theaters, Dolby Cinemas, that Reel Cinemas has been quietly operating in Dubai Marina Mall for over a year and recently in Dubai Mall for just a month or so. Dolby, revered for their hi-def cinematic audio technologies, claims these theaters are capable of immersive surround sound and image quality that’s brighter, clearer, displays more colors and delivers the deepest blacks. But is it enough to entice even true cinephiles to go out and spend AED75 for a Dolby Cinema ticket rather than stay at home with their state-of-the-art home theatre setups? The Dolby Cinema is all about delivering a complete experience, not just enhanced audio and visual tech, and immersion is at the forefront. Before even walking through the doors to the auditorium, you’re met with an audiovisual pathway that projects a wall length backdrop of the feature film you’re about to watch. The idea is to get you thinking about the film before being seated and create a story telling atmosphere. It sounds gimmicky and even if it doesn’t have the desired effect, it does look cool. The auditorium itself is bathed in black from the premium seats to the walls and ceiling, making it an optimum dark room. Subtle blue cove lights run along the the lower sides that are bright enough for you to find your way around the room but do not interfere with the darkness. The seats are placed in a slightly curved manner and face a wall to wall screen that has great viewing angles. Dolby claims because of this, there’s no real need to sit front and center to enjoy a movie anymore since every seat has an optimum sight line. However, we reckon if this was the case then the bottom two rows of Dolby cinemas wouldn’t cost AED25 less and we still recommend to find a seat that’s higher up than the first 5 rows from the screen. But seating and atmosphere aside, it’s the audio and visual wizardry, Dolby Atmos and Dolby Vision, that drive the Dolby Cinema Experience. You might have heard of Dolby Atmos, it’s become the industry standard for a studio grade audio system and can be found in several cinemas across the UAE already. It uses object-based surround sound that allows sound designers to place up to 128 different sound objects that fade from speaker to speaker so you can really feel that helicopter buzz around you. The demo we were shown was very impressive but something to keep in mind is that there aren’t many films that are customising their sound design to take complete advantage of this tech so the difference may not always be clear. In the Dolby Cinemas auditorium, there are over 60 speakers that are placed in front of the room and on the ceiling that encircle you in a dome like fashion and seats themselves get rumble effects from heavy bass. These speakers are out of view and you can never really pinpoint where the sound is coming from which really adds to the experience. That being said, it does get a tad too loud in there and very occasionally it can drown out the sound effects that aren’t completely optimised for Dolby Atmos. The pinnacle of this entire feat is Dolby Vision. Modern screen and tv tech are all about those 4k resolutions, contrast levels and deep blacks, something that’s very hard to reproduce in theaters who suffer from dim screens and washed out colors. This is what OLED TVs like the LG’s Signature OLED have essentially improved upon in spades for TVs and Dolby accomplishes similar results for cinemas with its dual laser projection system. The resulting image quality has twice the brightness of a standard cinema screen, copious amounts of colors, clarity and most importantly better contrast and deeper blacks so you can properly enjoy those dark scenes and effectively immerse yourself in the movie. And you don’t have to be a visual enthusiast to see the difference, which is immediately noticeable at first sight even if the movie you’re watching isn’t visually graded for Dolby Vision. If you aren’t sold on Dolby Cinema’s other features or think them frivolous, it’s the screen technology that’s really worth going for. Ultimately, Dolby Cinemas delivers pure movie-watching joy experience well worth the AED75 price of admission. 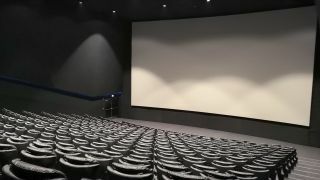 Currently, there are only two Dolby Cinema installations in Dubai with plans to open more; a 172 seat auditorium in Dubai Marina Mall and a large 300 plus seater with a larger screen in Dubai Mall.